Public art is democratic art. It brings fine art out of museums and galleries and places it in front of real people: people who live or work in downtowns, people who travel through busy intersections, people who visit sites of historical importance. Sometimes, you can walk right up and touch public artwork. Public art also helps to shape the image of a city. Many of the greatest cities in the world are immediately associated with their public art. Think of New York’s Statue of Liberty, Paris’ Eiffel Tower, or even Chicago’s Art Deco architecture. It’s hard to think about these cities without their art. 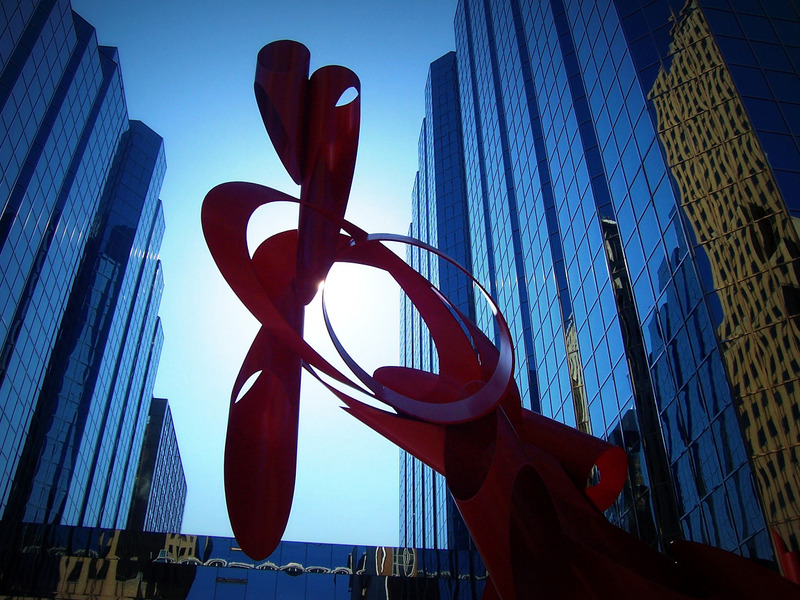 Luckily for us, Oklahoma City also has some fascinating works of public art, and is currently in a position to produce even more. The state of Oklahoma has had one of the most progressive policies of funding public art in the country. I say “currently” because this policy has drawn fire and criticism in recent months and could use a little support. I believe that this policy is important as it creates jobs and helps push the city forward. 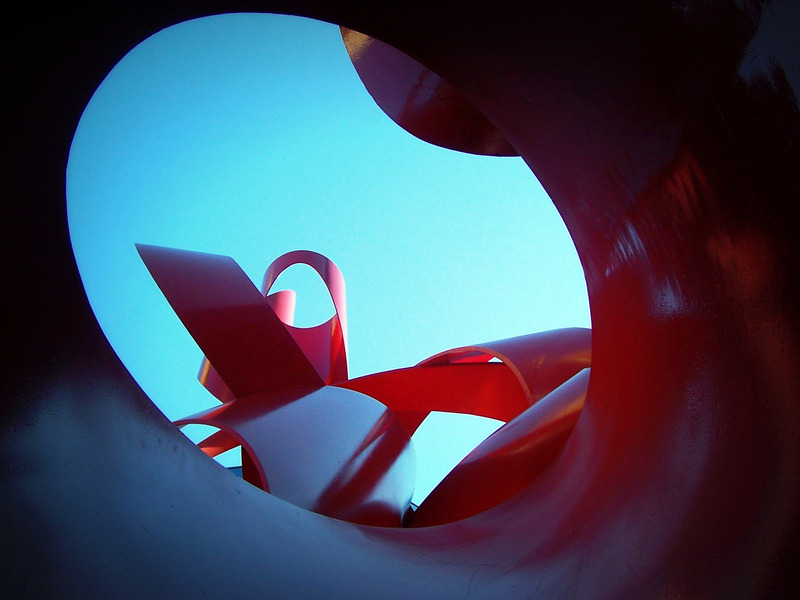 Alexander Liberman’s Galaxy is a sculpture that springs immediately to mind among Oklahoma City’s public sculptures. 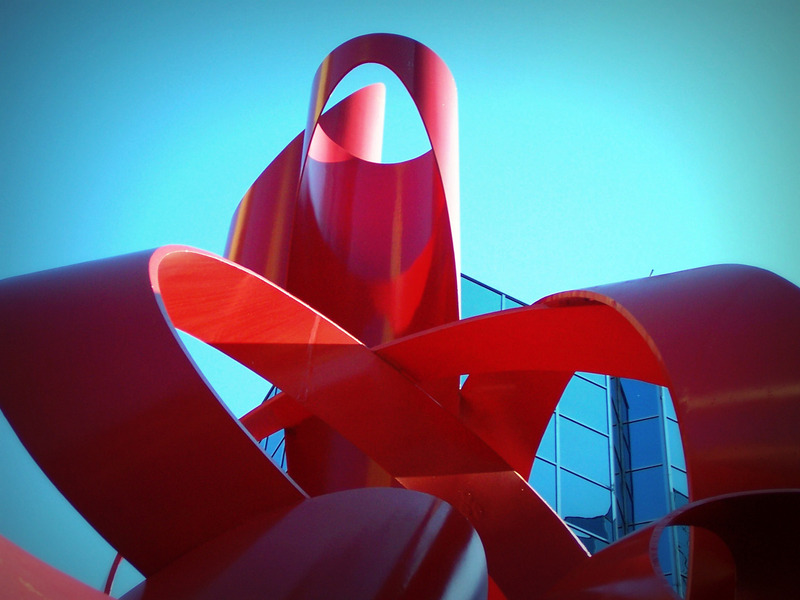 Located on a highly travelled downtown street and often captured in city PR materials, Galaxy’s bright red arcs and loops have quickly become an iconic part of the cityscape. The piece rises straight out of a plaza on Robinson Avenue, perched at an improbable angle, just outside of the west entrance to Leadership Square. It weighs 14 tons, but it looks weightless as it stands. Somehow, its angular pose does not feel heavy or about to tip: it looks like it might take flight. The uplifting feeling of this piece takes some stuffiness out of the sharp mirrored faces of Leadership Square and other downtown buildings. It is lighthearted and bold, installed with no pedestal so that any visitor can approach on foot and even touch the work. There is something unflinchingly positive here. The artist describes this optimistic feeling as intentional, although it also belies Liberman’s background and influences. Born in Russia in 1912, Liberman’s childhood was marked by the 1917 Revolution and its aftermath. In interviews, he referred to the aesthetics of his youth as his influences: he described the many temporary monuments and large marches of the time, with their “red banners, gigantic red banners. 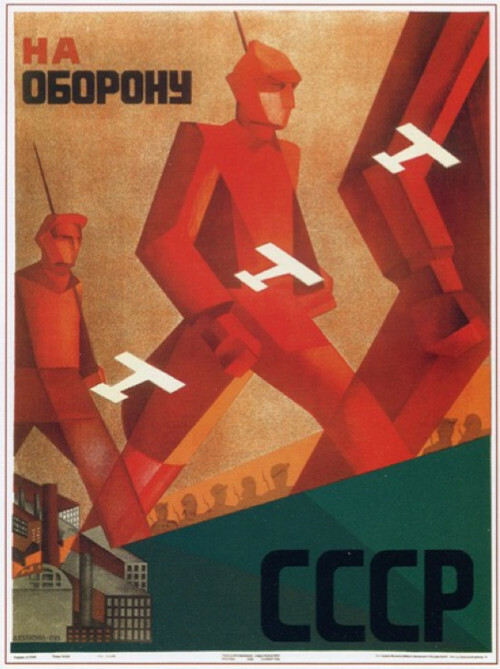 Quite frightening things in the street.” His youth was also the age of Russian Constructivism – a movement best known for commercial art and propaganda posters and often marked by clean lines and angles, graphic images, and lots of red and black. Liberman’s family moved to Paris in 1924, and he began his career in the publishing industry there in 1933, working for a left-leaning general interest magazine called Vu. This work proved to be Liberman’s calling, and he continued work in this field after moving to New York City in the early 1940s, after a hiatus that included a painting career and a year in the French army. Now well-known for his sculptures and paintings, the great majority of Liberman’s creative work was as art director of Condé Nast magazine, a position he held for over 30 years. Working at Vu, Vogue, and Condé Nast, Liberman oversaw the work of many of the 20th century’s most noted and influential photographers: Brassai, Man Ray, Robert Capa and many others. Under his directorship in 1944, Condé Nast broke ground by publishing Lee Miller’s devastating photographs of gas chambers at the Buchenwald Concentration Camp. His paintings are in the collection of the Metropolitan Museum of Art, his sculptures are in some of the most prominent collections in the world (including the Guggenheim Museum, the Tate Gallery, and the Hirshorn Museum), and his public art pieces are scattered, installed in Phoenix, St. Louis, Hawaii, and many other places. It’s maybe an understatement to say that Alexander Liberman had an incredibly diverse and productive career. It’s not necessary to know this much about an artist’s life to appreciate Galaxy. Good art stands on its own- sometimes literally- but hopefully, viewers can gain insight or connection by being able to put art into context. It’s also worth noting a bit about the state of Oklahoma City’s downtown in 1984, when the sculpture was installed. By the early 1980s, much of downtown had been gutted through the efforts of the Urban Renewal Authority and plans commissioned from architect I.M.Pei, and the city was at the beginning of the devastating oil bust. Briefly, the URA and the “Pei Plan” resulted in the demolition of over 400 downtown buildings in the 1960s and 1970s, with the idea that new structures and reorganized “superblocks” of buildings would lure businesses back from growing urban sprawl. Friends who lived in the area at the time describe travelling downtown with their families on Saturdays to watch demolitions. Some of these buildings were historically significant. Buildings declared “blighted” and subsequently destroyed during this period include the Criterion Theater, the Baum building, and a busy shopping center on Main Street that was home to Katz Drug Store, site of a historic 1958 sit-in for integration led by Clara Luper. Leadership Square was built as part of the last gasp of the original Pei Plan projects. Also notably, this was a year and a half after the collapse of the Penn Square bank- the major catalyst in the oil bust of the 1980. This oil bust led to a recession that arrested downtown construction projects and Oklahoma’s economy for the better part of the next decade. It is extraordinary that this lovely piece is a part of our city. Standing 44 feet high, 27 feet wide and 12 feet deep, Galaxy is a lofty and hopeful statement that makes you- literally and figuratively- raise your head and look up. (c) Jennifer Barron All rights reserved. Photos (c) Natalee Dobbs except where noted. Please do not reproduce photos without Natalee’s permission. Tagged Alexander Liberman, Chicago, Clara Luper, Cond Nast, Katz Drug Store, Leadership Square, Lee Miller, Man Ray, Oklahoma City, Paris Eiffel Tower, Pei Plan, Robert Capa, Russian Constructivism, URA, Valentina Kulagina. Bookmark the permalink.